Biking and cycling is one of the favorite hobbies of the new generation. It is a user-friendly activity, and just about anybody can do it regardless of gender or financial status. Biking is a popular activity specifically because of two important reasons: first, it is an excellent way of keeping fit; second, it is a cheap and effective means of transportation. However, as I found many times, cycling does have its set of drawbacks. One of the most annoying is getting a flat tire. For new cyclists, getting a tire punctured is a very stressful event, particularly in very uncomfortable times and places. If you do not know how to perform a basic tire repair, then you could be in trouble on the road when the situation arises. On the other hand, if you know how to do fix minor tire repairs, then it would be an entirely different story. So, what are the things that you need to do in fixing a flat tire? 1. The first thing that you need to do is to locate the puncture. Is it in the front? Or the back? Normally, it is easy to spot where the puncture is. When there are small and repairable punctures on one or two of your tires, you would be able to see objects protruding from the punctures site. There would be nails, pins, thorns, sharp bones, and many others. If the puncture is a small one, then you can fix the said tire. However, if the damage is big, or if the tire has been blown out, then you need to replace the tire interior entirely. It is for this reason that you always need to bring with you a spare interior for these emergency occasions. 2. 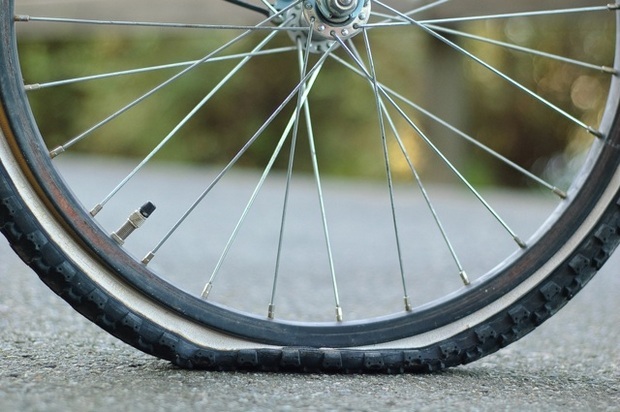 Once you have found the exact location of the puncture, you now need to position the bike so it is easier for you to remove the damaged tire from the rest of the bike. You have to understand that, in order to perform this operation, you need to remove the interior from the tire body. It is not the outside surface of the tire, or the exterior, that needs to be fixed. It is the air-filled circular rubber lodged in between the rim and the exterior that needs the fixing. Now, removing this is pretty tricky. That is why you need to position the bike properly. Sometimes it’s best to turn the bike over in order to be able to spot where the damage is, and then remove the tire with wheel with the damaged tire. From here, the rest is a walk in the park. 3. On finding the damaged tire, you now need to extract the broken interior. To do this, you first need to remove the air from that interior. Basically, while the tire is currently flat, it still contains substantial amount of air so as to make its extraction difficult if not utterly impossible. To be able to extract the interior, you need to remove all the air by depressing the Schrader valve stem – the protruding part of the tire rim where the air goes in. There are two ways to do this: first, you can use a specialized depressing tool known as a tire valve tool; this completely drains out the air from the interior; and the second is by simply pressing on the small metal cap using a ballpen or anything pointed. 4. Once air has been drained out of the interior, it is now time to pry out the interior from the rim. Now, this is perhaps the trickiest part, arguably speaking. Here is how to do this part….Using tire levers – or any material that can be used as levers (like screw drivers) – expose the interior by putting these levers to split open the gap between the exterior and the rim. Once the levers are lodged, apply enough pressure so as to expose the interior even more. You need to pry the tire loose entirely from the rim in order to make the needed repairs. Once the interior is exposed, and once there is enough opening between the rim and the exterior, slowly pull out the interior. Make sure that the said interior does not hang from the frame of the bike. 5. Having isolated the interior from the rest of the tire frame does not automatically mean that you will be able to spot the exact place of rupture. Indeed, this is a very complicated task by itself. But, you can simplify this by putting air on your interior. Once you have pumped enough air, put the interior into water to easily find the hole (obviously, bubbles will escape from the punctured part). If there is no such supply of abundant water, you can just put the interior close to your air and listen for escaping air. 6. Once you have found the hole, mark it with any kind of marker. You can easily lose this part if you do not apply any markings to it. Once you applied the needed markings, compress the interior in order to drive out the air. 7. The next steps are probably the most important. However, to be able to do this, you need to have a tire mending kit. Without this kit, doing this procedure is but impossible.First, you need to put a buff on the puncture. Then you need to apply a strong adhesive or patch glue. Wait for a couple of minutes for the patch glue to dry. 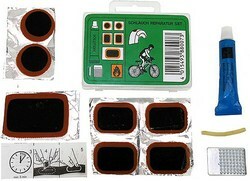 Finally, get the patch from your mending kit, peel it carefully, and then apply the sticky part to the punctured portion. Make sure that the buffed portion is absolutely free from any kind of debris as these can cause the patch to dislodge. I also recommend a good multitool to carry with you. 8. Last step!….Slide the interior back to the tire. Make sure that the valve stem is properly upright before you pump air. Once this is done, put enough air pressure. Again, we have to remember that if the damage to the tire is significant, or if the puncture is more than an inch then do not waste your time and energy fixing the tire. At this point, having a spare tire would truly save you! Posted in Education on October 24, 2013 by Rich. Cycling is one of the most favored exercises, especially here at StrandCyclist.com. It is popular for several reasons. First, it is a pretty neat way of transportation if you think about it. Indeed, you can save a lot if you use your bicycle to move from one place to another. Secondly, cycling is pro-environment. Bicycles do not need fuel – so, it is both good for your health, and it is good for our planet’s health. However, there are certain things that need to be borne in mind for individuals who may engage in cycling either as an exercise, or as a way of life, or both. It must be noted that one in five accidents all over the world are cycling accidents, mainly because cyclists do not really adhere to traffic rules as much as they should. Obedience to traffic rules is, in fact, our first tip for safety. Also, do not under any circumstances ride without a helmet! Traffic rules and laws vary from one state to another. More so, rules vary greatly between cultures and between countries. The most important thing is, before one rides with the traffic-at-large, he or she must familiarize himself with all the traffic rules of the place. As a matter of fact, simple familiarization might not be enough. It would be very wise for a cyclist to actually put to heart these different rules as this would certainly save him time, money, and even his life. As we have mentioned in the preceding paragraph, cyclists are involved in accidents largely because they fail to obey rules, not so much because they do not know the rules, but because of blatant disregard for the aforementioned rules. Cyclists, because of the mobility and size of their machines, are arrogantly confident are immune to traffic accidents. Well, they couldn’t be more wrong. In the United States, the correct lane is the right lane. So, as a rule of thumb, you stay on that lane. It is an act of utter foolishness to drive against a flow – this can either put you in jail or in the morgue. Staying on the right lane is just the first part of the trick. Now, being a cyclist with a very light machine, you need to make sure that you stay on the lane reserved for light machines, like your cycle. Some cyclists actually take this to the extreme by travelling on pedestrian lanes or sidewalks. While this might be relatively safe, this activity is illegal in many cities and states. Again, stick to traffic rules. These rules say that cyclists should stay on the far right. If you do this, other motorists will respect your place. However, one must not be on the extreme far right – you should make sure that there is still room for emergency maneuvers, just in case the worst happens. In Europe, and in many other countries in Asia, the correct lane is the left lane. It is important for an American used to American traffic norms to familiarize himself with this orientation. Trucks are large vehicles which might not be able to see puny road users like cyclists. As a rule of thumb, when you see a truck or a lorry, give way. Giving way to big machines is not simply showing respect to the mammoths, it is also safe since large machines travelling at high speeds can cause turbulence – yes, turbulence – which can throw you off balance. Furthermore, unwritten traffic rules say that cyclists must not attempt to overtake trucks, unless the latter is signaling that he is going to slow down or stop. Cyclists must stay behind trucks – far behind them, in fact. Basically, this simply means that you need to use your head and your common sense all the time when you are on the road. You have to remember that you are travelling with thousands of metal monsters and a single mistake on your part can cost you your life. Thus, be predictable; being predictable means that you need to travel at constant path and speed. Changing lanes unpredictably is very dangerous and you can be hit by fast-moving vehicles. Even your speed must be somewhat constant. You have to always bear in mind that the other motorists on the road expect you to be constant; furthermore, if you reduce your speed with an inattentive driver behind, you will be in a very terrible accident. In the first place, this is the reason why you should always stay on the lane reserved for cyclists. Finally, always stop when the light says stop or you approach a stop sign. Some cyclists seem to trust their machines so much that they actually think they can pass through small cracks in the traffic. Well, sometimes, with luck on your side, you can do this. But, if you push your luck too far, you will lose your life. It is important to remember that riding a small and light machine like your bicycle makes you very prone to accidents. Plus, you do not have seatbelts; you do not have any protective structures which can protect you from violent crashes. All you have is your suit and your helmet, which can do nothing in violent accidents. Always travel with the utmost care and presence of mind. Never take anything to chance. Always obey traffic rules. Posted in Education on October 15, 2013 by Rich. Bicycling is one of the most popular activities these days. It is very popular in most countries, and it is popular to all people of both gender and of all ages. Indeed, it is an activity that is enjoyed universally, figuratively speaking. After all, it is a pretty effective way to exercise. After hours of cycling, you are able to burn off a lot of your belly fats, you are able to travel miles, and you are also doing your part to save our mother earth. However, to get the most out of cycling it’s important you find the right bicycle for you. It’s important to understand that there are many types of bicycles, and each type is generally designed for specific purposes. In this article, we are going to discuss the main types of bicycles, and we will see where your lifestyle and your exercising preferences fit. As the name implies, road bikes are bikes specifically designed for concrete and asphalt roads. These are slender, light, and thin bikes designed primarily for speed. Road bikes are not designed to be heavy; they do not need to be. As a matter of fact, road bikes need to be light in order for them to be speedy. The tires of the road bikes are thin and light, too. They need to be. Concrete and asphalt eats away rubber. Thin tires make sure that there is not too much contact between the rubber and the hot pavement. Furthermore, the thin tires make for easier movement and increased maneuverability. These two are important in busy city roads where there is a lot of traffic. Basically, the signature design of the road bikes is that they are meant primarily for speed. Everything about it is intended for this purpose: the sleek frame, thin tires, and even the positioning of the driver. If one observes carefully, a road bike driver has his top body forward. This is for comfort, but it is more for aerodynamic reasons. 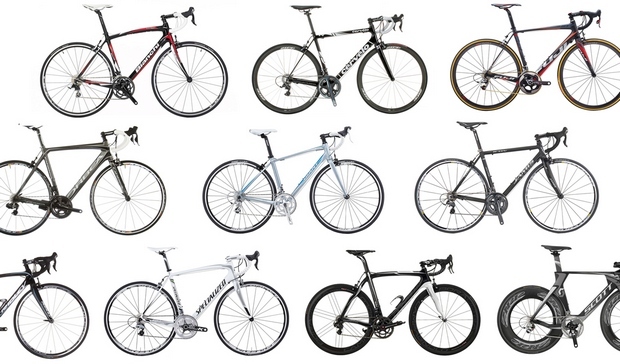 Road bikes are distinguished from other bikes through two important features. First are the flat-bar handlebars. These handlebars allow riders to ride in an upright position. If the rider wishes to just stroll around or slow down, these handlebars are generally preferred. Most riders also find these more comfortable because of the body positioning that it allows. The second signature feature is the drop-down bar. Basically, the drop-down handlebars is what isolates the road bikes from the other bikes because these allows the driver to take a reclining position, thereby increasing energy efficiency, and, thus, maximizing speed. 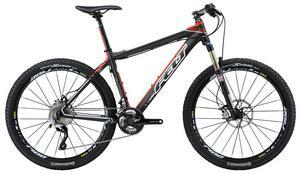 Mountain bikes are bigger and more heavily built that the road bikes. After all, as the name implies, mountain bikes are not designed for use in the pavement. Instead, mountain bikes are meant to challenge the raw forces of the natural grounds. Mountain bikes have full suspension; this ensures comfort even in the most uncomfortable terrain. Mountain bikes can handle rocky plains, jagged hills, dirt trails, and even semi-dense forests. In order to have these capabilities, the bikes are designed with a heavy and strong body to absorb severe punishments, they also have excellent braking systems which are critical for mountain travels, and they have thick rubber tires to ensure that the bike has enough hold on the ground, however inconsistent that specific ground might be. There are two general categories of mountain bikes: frontal suspension, and full suspension bikes. Frontal suspension bikes are significantly cheaper than full suspension and offer less comfort. Recreational bikes are also known as hybrid bikes. These bikes are typically favored by individuals who are new to bicycling. Generally, most individuals think that these hybrid bikes possess the impressive features of both road and mountain bikes. Well, hybrid bikes do have some of the important features of the two, but only to a limited extent. Basically, you can use these bikes on the road, and they are equally comfortable off the road. However, if you are into more specialized biking, you will realize that this hybrid bike falls short of your standards. They may be useable on the pavement, but they do not handle as well as the road bikes. As a matter of fact, using a hybrid might not be a smart idea to enter a very busy traffic. Feminists might say that certain bike manufacturers have gender bias. The truth of the matter is, the physiology of men differ from that of women. As such, bike makers have designed bikes which are more proportionate to the physiological features of women. More specifically, these bikes are a tad shorter than the typical men’s bikes. Furthermore, mountain and road bikes have versions for females. So, we’ve summarized the general categories of bikes. In addition, there are other types of bikes that you will see in the bike stores but we’ll save those details for a subsequent article. Posted in Education on October 3, 2013 by Rich. Welcome to Strand Cyclist. My name is Mike Strand and I've been cycling for over twenty years. I created this site to share the insights, tips and recommendations I've developed over my time on the saddle. Thanks for visiting!